The Convention for the Rights of Persons with Disabilities is on Course for Ratification in the U.S. Senate — Maybe This Week! The Convention on the Rights of Persons with Disabilities (CRPD) came up for a vote in the Senate Foreign Relations Committee last week, and it won easy approval. By a 13 to 6 margin, the treaty gained bi-partisan support, and Senator John Kerry (chairman of the committee) indicated that he will seek a vote of the full Senate within days. A 2/3 vote in favor of the treaty is needed for ratification. 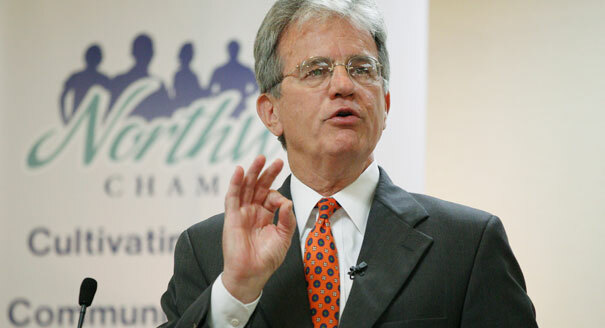 To our knowledge, Senator Coburn has not taken a public position on the CRPD. He is not generally known as an advocate for people with disabilities, yet he has spoken favorably of some international agreements — particularly those that serve to protect intellectual property rights. So, there is a possibility that he will vote “yes” on the CRPD. (Senator Inhofe disappointed us by voting against the treaty when it received a hearing in the Foreign Relations Committee). (1) This treaty will help bring the rest of the world up to American standards — guaranteeing that disability is not an arbitrary barrier to employment, education, etc. (3) Another reservation adopted by the committe states that the treaty does not address “the provision of any particular health program or procedure,” meaning the treaty doesn’t create any new abortion rights beyond the duty not to discriminate against people with disabilities. The third point is particularly important since some treaty skeptics have raised opposition to the treaty on the grounds that it recognizes the right of equal access to reproductive health services. The Foreign Relations Committee has tried to make clear that the treaty’s reference to reproductive health is intended to cover the full range of health services in this category — including fertility treatments, etc. — without singling out any procedure for special consideration. Your action on this treaty will help to assure ratification by the United States Senate. Moreover, it will help to protect the rights of people with disabilities around the world — including the rights of Americans traveling abroad. In a previous article, we encouraged all of our members and friends to call or write Senator Inhofe urging him to support the Convention on the Rights of Persons with Disabilities. In passing, we mentioned that there is some opposition to the Convention — even though the treaty enjoys broad support from the American public. In the interest of educating about the purpose and contents of the treaty, we would like to offer this item-by-item analysis of the objections that have been raised by treaty opponents. Here is our response to an article published by the Home School Legal Defense Association, a group that is focused on policy advocacy. Any remaining state sovereignty on the issue of disability law will be entirely eliminated by the ratification of this treaty. The rule of international law is that the nation-state that ratifies the treaty has the obligation to ensure compliance. This gives Congress total authority to legislate on all matters regarding disability law — a power that is substantially limited today. Article 4(5) makes this explicit. For more than 20 years, our nation has recognized that the rights of people with disabilities transcend state boundaries, and so federal laws have been written to effectively promote and defend those rights. Few people want to go back to the time before the passage of the Americans with Disabilities Act. The requirements of the Convention on the Rights of Persons with Disabilities are completely congruent with present American law. That is why the treaty has the bi-partisan support of prominent Americans, including former President George H.W. Bush, former Senator Bob Dole, Senator John McCain, and many others. Article 4(1)(a) demands that all American law on this subject be conformed to the standards of the UN. Section 4(1)(a) of the treaty does *not* refer to “standards of the UN.” Rather, the States Parties agree “To adopt all *appropriate* legislative, administrative and other measures for the implementation’ of the rights recognized in the convention….” (Emphasis added). Article 4(1)(e) remands that “every person, organization, or private enterprise” must eliminate discrimination on the basis of disability. On its face, this means that every home owner would have to make their own home fully accessible to those with disabilities. If the UN wants to make exceptions, perhaps they could. But, on its face this is the meaning of the treaty. American laws on disability rights are among the most progressive in the world, and we do not expect any changes as a result of joining the Convention on the Rights of Persons with Disabilities. The Convention has *no* requirement for individual home owners to retrofit their houses to make them fully accessible. Rather, under this section of the treaty, the United States and other nations will agree to “…take all *appropriate* measures to eliminate discrimination on the basis of disability by any person, organization or private enterprise.” (Emphasis added). The treaty recognizes the concept of “reasonable accommodation” — an idea that most Americans are familiar with. It is a legal concept that is well-developed under United States law. 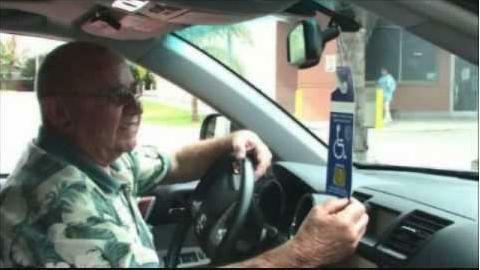 Article 4(1)(e) also means that the legal standard for the number of handicapped spaces required for parking at your church will be established by the UN — not your local government or your church. There is no place in the Convention that refers to the number of parking spaces that must be made available to people with disabilities. Under the treaty, the U.S. government will be responsible for implementing appropriate measures to protect the rights of people with disabilities. The UN has no authority under this treaty to directly enforce rules about parking spaces. It does not revoke or remove the authority of local governments to establish reasonable regulations in this regard. Article 4(2) requires the United States to use its maximum resources for compliance with these standards. The UN has interpreted similar provisions in the UN Convention on the Rights of the Child to criticize nations who spend too much on military issues and not enough on social programs. There is every reason to believe that the UN would interpret these provisions in a similar fashion. The UN believes that it has the power to determine the legitimacy and lawfulness of the budget of the United States to assess compliance with such treaties. Article 4 of the treaty describes the “general obligations” of each State Party. Under the treaty, the United States will agree to take measures to achieve the “full realization” of the rights of people with disabilities. Within this context, the treaty recognizes that full implementation may occur “progressively,” and there is an explicit recognition that nations are constrained by “available resources.” Under the treaty, the UN has no authority to dictate the budget of the United States or any state or local government within our federal system. Article 6(2) is a backdoor method of requiring the United States to comply with the general provisions of the UN Convention on the Elimination of All Forms of Discrimination against Women. This treaty enshrines abortion rights, homosexual rights, and demands the complete disarmament of all people. Article 7(2) advances the identical standard for the control of children with disabilities as is contained in the UN Convention on the Rights of the Child. This means that the government — acting under UN directives —- gets to determine for all children with disabilities what the government thinks is best. Additionally, under current American law, federal law requires public schools to offer special assistance to children with disabilities. However, no parent is required to accept such assistance. Under this section the government — and not the parent — would have the ultimate authority to determine if a child with special needs will be homeschooled, attend a private school, or be required to accept the program offered by the public school. Article 24 of the treaty (“Education”) establishes the principle that all people with disabilities have the right to an education, and this right should be realized “…without discrimination and on the basis of equal opportunity.” So, to the extent that an able-bodied child may enjoy an education at home, the Convention on the Rights of Persons with Disabilities will serve to equally allow a child with a disability to enjoy the same privilege. The United States, as a wealthy nation, would be obligated to fund disability programs in nations that could not afford their own programs under the dictates of Article 4(2). This is what “the framework of international cooperation” means. As previously noted, Article 4 of the treaty describes “general obligations” of State Parties. It does not lay out specific requirements for how international cooperation must take place. The concept of “international cooperation” is addressed in Section 32 of the Convention on the Rights of Persons with Disabilities, and it includes a list of suggested measures which nations could agree to pursue — but none of these measures are described as mandates. And, in any case, the treaty provides that each nation is responsible for fulfilling its own obligations under the treaty. Also, under the principle of national sovereignty, the UN has no authority to dictate the budget of the United States nor of any other member state of the United Nations. Article 15’s call for a ban on “inhuman or degrading treatment or punishment” is the exact same language used in the UN CRC which has been authoritatively interpreted to ban any spanking by parents. 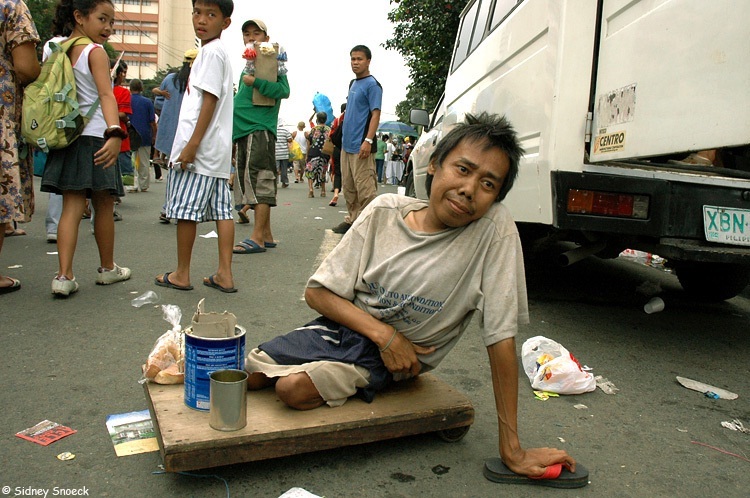 It should be noted that Article 15 is not limited to persons with disabilities. It says “no one shall be subjected to … inhuman or degrading treatment.” This means that spanking will be banned entirely in the United States. “No one shall be subjected to torture or to cruel, inhuman or degrading treatment or punishment. In particular, no one shall be subjected without his or her free consent to medical or scientific experimentation. The prohibition on “inhuman or degrading treatment or punishment” appears in several laws, treaties, and international agreements. For example, an identical phrase appears in the United Nations Convention Against Torture, which has been American law since 1994. In this sense, Article 15 does not add any new requirements that we have not already agreed to. As to an interpretation under the “UN CRC” (the Convention on the Rights of the Child), it should be noted that the monitoring and enforcement mechanisms of the Convention on the Rights of Persons with Disabilities are entirely separate from the enforcement mechanisms of the CRC. The CRC treaty is monitored by a UN Committee on the Rights of the Child. In contrast, the monitoring and enforcement mechanisms of the Convention on the Rights of Persons with Disabilities are the responsibility of an 18-member Committee on the Rights of Persons with Disabilities — with members elected by the State Parties. Article 25 [sic] on Education does not repeat the parental rights rules of earlier human rights treaties such as the International Covenant on Civil and Political Rights or the International Covenant on Economic, Social, and Cultural Rights. This is an important omission. Coupling this omission with the direct declaration of “the best interest of the child” standard in Article 7(2), this convention is nothing less than the complete eradication of parental rights for the education of children with disabilities. The topic of Education is actually addressed in Article 24 of the Convention on the Rights of Persons with Disabilities. Article 24 does not repeat the provisions of the International Covenant on Civil and Political Rights or the International Covenant on Economic, Social, and Cultural Rights because these covenants are explicitly acknowledged in the Preamble of the Convention on the Rights of Persons with Disabilities. We ask you to review the provisions of the treaty. Evaluate them based on your own experience with respect to the needs of people who struggle with a disability. Then, contact our Oklahoma senators (Sen. Coburn and Sen. Inhofe) and share your independent judgment with them. Can You Call or Write Senator Inhofe? Since the passage of the Americans with Disabilities Act in 1990, people with disabilites in our country have had greater opportunities to go to school and gain employment and to enjoy participating in life. At the global level, the rights of people with disabilities are recognized in a treaty that was born out of the United Nations — the Convention on the Rights of Persons with Disabilites (CRPD). (The United Spinal Association is an advocacy organization for people with spinal cord injuries, MS, ALC, polio, spina bifida, etc. It is just one of the groups of people who are pushing for ratification of the CRPD). The treaty has gained wide support around the world. The text of the convention was approved by the UN’s General Assembly in 2006. Since then, 153 heads of state have signed the CRPD, and 117 nations have ratified it. President Obama signed it on July 30, 2009. The United States Senate hasn’t ratified it yet, but that is about to change. The Foreign Relations Committee has begun hearings on the measure. Advocates have emerged. Prominent supporters of the treaty include former Senator Bob Dole (our neighbor from Kansas), former Rep. Tony Coelho, former presidential candidate John McCain, and others. One of the key votes in the Foreign Relations Committee is held by our own Senator from Oklahoma, James M. Inhofe. Senator Inhofe isn’t generally known as a great supporter of international agreements, but he has won plaudits for his compassionate concern for people with disabilities (especially veterans). We think Senator Inhofe will cast a vote in favor of the CRPD, and we want to fortify his resolve. Plus, we know he is getting messages from people in our state who are opposed to this Convention — so, we feel like we’ve got to speak up! Can you help by calling or writing Senator Inhofe’s Washington office? The next hearing on the CRPD hasn’t yet been announced, but we expect it to take place in the next month or two. Then, a final vote in the Senate will probably occur after the elections in November. Your contact with Senator Inhofe’s office is going to make a difference. Thanks for your support of this important effort! Only 10 responses have been recorded so far, but already a trend is emerging. 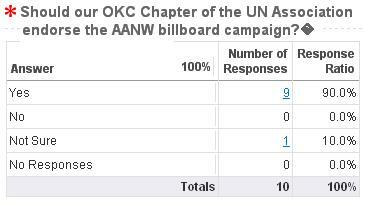 Nine of the respondents think our OKC chapter of the UN Association should endorse the AANW’s billboard campaign. One person recorded a “Not Sure” answer. Most of the respondents so far have been members of our Association — 6 out of 10. Three people describe themselves as “Not Yet” members. If you haven’t answered the survey yet, you are welcome to give us your opinion. 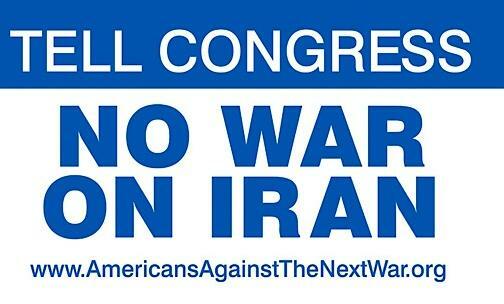 Should UNA-OKC Endorse the “No War on Iran” Billboard Campaign? The campaign is supported by several individuals and organizations that are friendly to the United Nations Association, including some members of our Oklahoma City chapter. The question has been raised: Should our chapter make a formal decision to endorse this billboard campaign? It is a question that seeks a Yes or No answer, but the issue is not a simple one. First of all, it should be pointed out that the organizers of the campaign are not asking us to contribute funds for the billboards (which have already been paid for). So, this is strictly a question about lending the name of our organization to the campaign. 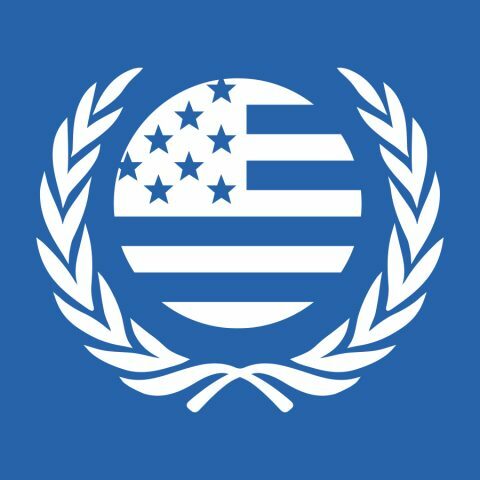 From another perspective, some of our members have expressed the thought that a billboard message doesn’t offer the proper format for expressing our Association’s support for American leadership in the United Nations. We would like to know what you think. Should we, as a chapter, endorse the campaign? The Preamble of the Charter sets out a description of the UN’s values as well as its purpose for being. It occurs to me that in our modern era, which is often characterized by doubt and despair — and even cynicism — about the future of our nation and the world, it is appropriate for us to focus on the reaffirmation of faith that was expressed by the founders of the United Nations in 1945. When the UN came into being on October 24, 1945, the world was reeling from the horrors of World War Two. The delegates to the first General Assembly had survived the worst war in human history — including genocide, carpet bombing, mass executions, and the unleashing of the atomic bomb. The men and women of that generation might have been tempted to retreat behind their national borders, to throw up high walls, and to prepare for perpetual conflict. Today, we are challenged by contemporary problems that require a global response — international terrorism, various forms of human trafficking, nuclear proliferation, and the threat of climate catastrophes. I think we can learn from the experience of our forebears who chose to work cooperatively together, to unite their strength, and to have faith in the fundamental rights and dignity of the human person.